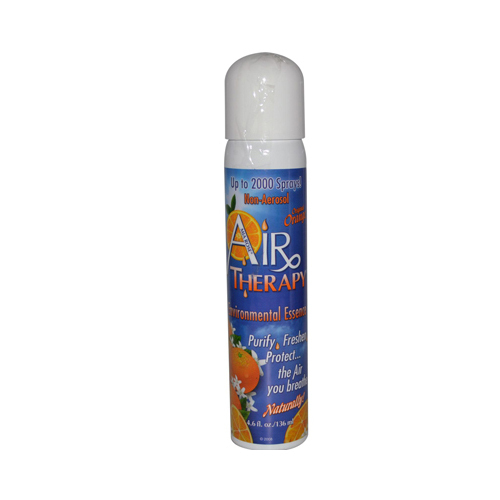 Air Therapy Spray, Original Orange - This non-aerosol mist neutralizes all odors, and its chemical-free, non-toxic, and safe for you and the environment. Each droplet contains active electrical ions (natures own air cleaners) that attract, neutralize and continuously clean the air you breathe. USDA accepted - safe around food and restaurants, Non-aerosol, recyclable steel, OSHA compliant Cruelty-free, Aromatherapeutic. Non-Aerosol. 1st in Citrus! Accept No Substitutes. Freshen, protect, revitalize the air you breathe. Naturally! Aromatherapeutic: refreshing/relaxing-relief from stress. Cheers, Calms and Comforts your personal atmosphere. One spray does it! Home, auto, campers, clinics, ventilation systems, revive dry potpourri safe enough for childrens nursery. Created for the health of the people and safety of the environment, as an alternative to artificial man-made chemical deodorizers. Free Of Harmful chemicals, aerosol, animal testing, CFCs. Disclaimer These statements have not been evaluated by the FDA. These products are not intended to diagnose, treat, cure, or prevent any disease.